Ray ate at home and at Andy Canouta’s father’s restaurant on the southeast corner where the parking lot for Jack Mackerel’s is – burgers, hotdogs, ham sandwiches or dinners with vegetables and they always had delicious homemade pies and cakes. 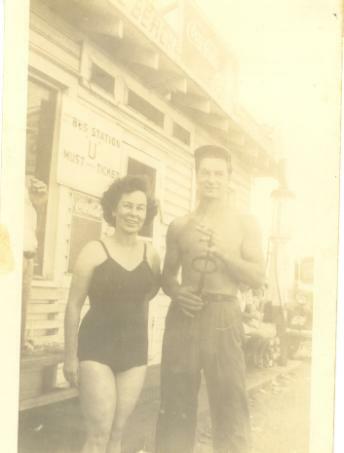 Ed and Gertie Lewis had a grocery store across the street on the southwest corner of the main intersection in Kure Beach, where the convenience store is now located. They had two gas pumps out front, regular and high test. They had a grocery store with a meat market and on the north end of the building they had a restaurant with about a dozen bar stools and 3 or 4 booths that each seated 4 to 6 customers. They opened at 5 am, cooked three meals a day and closed between 9 and 10, depending on the customers. The picture (left) shows Mrs. Lewis and her son in front of the store with kerosene pumps in the back on the left. Mr. and Mrs. Lewis built the little building on the north side of the store and restaurant and leased it to Mr. Bob and Mrs. Margaret Ford to operate a Bait and Tackle Shop. Today it is where the Ice Cream Store is operated. Ray worked for Mr. and Mrs. Lewis for 50 cents an hour, but he could eat and drink all he wanted while working. Gaining weight at that young age was not a problem as Ray was only 5‟ 10” tall and weighed only 129 pounds when he went into the Navy at the age of 17 years and two weeks in August 1955. Ray did everything there was to do at the store and restaurant – pump gas – stock groceries – run the cash register – cut different cuts of meats – and grind up beef for hamburger meat. He learned a lot from Mr. and Mrs. Lewis and continues to talk about it today, being thankful for their training. Mr. Lewis taught him how to cut up a whole side of beef or pork, how to cook and not to hit his hot grill with a Spatula unless you wanted a swift pop behind the back of your head. Ray said, “I was a very fast learner from Mr. Lewis”, I never got popped! Back then they did not have frozen French fries. They peeled as many as a hundred pounds of potatoes a day, sliced ’em up, and cut them for French Fries or mashed potatoes. No hash browns, but all the regular, not quick cook, grits you wanted. Cole slaw, tater salad were all made from “scratch;” no ready-made deliveries from food service trucks. Ray went to work at 4:30 am in order to have the grits ready to open at 5 in the morning for a good breakfast crowd. Fishermen were always up before daylight going out on the boats, on the piers, or surf fishing. Back then they believed you had to get an early start to have the best catch of fish! After breakfast, they would prepare the lunch menu, two or three different meats with home cooked vegetables. Dinner was pretty much a-la-carte, mostly shrimp and other seafood. Fresh, locally caught shrimp were peeled, deveined and washed before covering them lightly with Mr. Ed‟s secret cornmeal and whatever else he put in it. He also had his secret Hush Puppy recipe and they would cook hundred‟s of them every day. During the fall and winter, Ray’s Dad would do commercial fishing, netting Popeye Mullet up and down the beach and off Bald Head Island. One time they had a very, very big catch over at Bald Head Island. They brought them back in several boat loads and filled two dump trucks full of Popeye Mullet at The Basin Marina. They took them to the market in Wilmington. Ray recalls his Dad and DP being very, very upset when they were paid 2 cents a pound for the small ones, 4 cents a pound for the medium and a big 6 cents a pound for the large ones, which were about a foot and a half long. They had that nice big catch and learned when the market is flooded, the price goes down. There was more than one Fish Market downtown Wilmington off the foot of Market to the south. These markets would sell a lot of the local catches to locals. These markets also shipped seafood out of Wilmington via boats, trucks, and train. A lot of folks here and up state ate salted Popeye Mullet, especially for a fish and eggs breakfast. 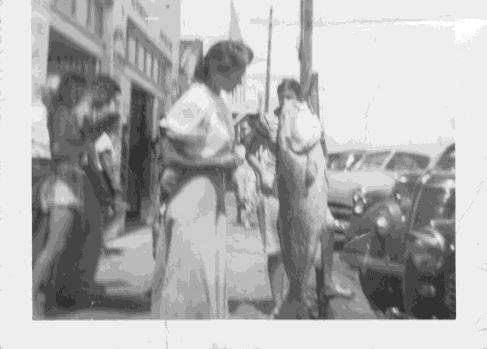 The bigger female Popeye Mullet provided a large market for fish roe that lots of folks coated with cornmeal and fried. Back then J. H. Lea and Sons had a very large fish market in Hampstead, but it was too far away to truck the catches from lower New Hanover County to be sold. J.H. Lea and Sons had lots of large trucks and provided many markets and restaurants up and down the east coast, fresh caught seafood.